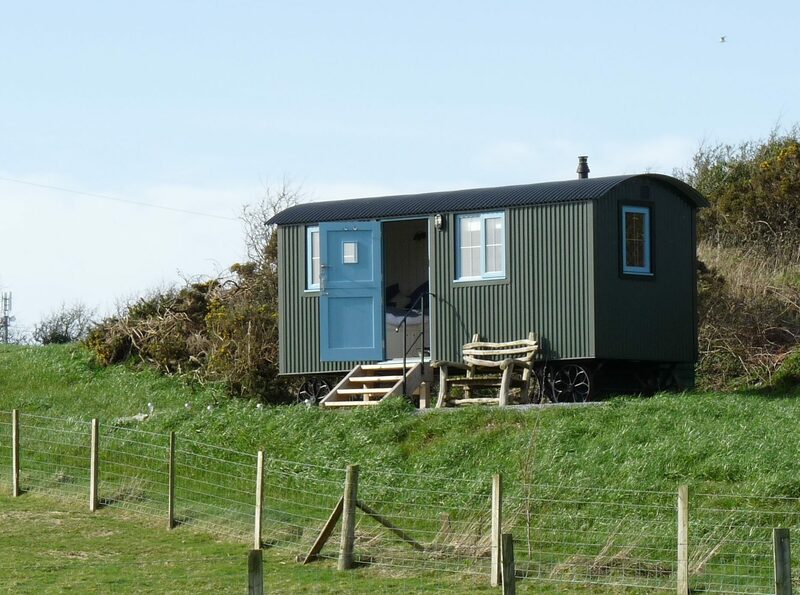 …to Anglesey Shepherds Huts at Cae’r Bryniau. Two beautiful little huts near the north west coast of Anglesey await your visit for a luxurious glamping experience. Situated in farmland on an elevated spot with views across the island to the mainland mountains, they have everything you need for a break away from it all. Outside the huts you have your own firepit and barbecue, inside a mini kitchen so you have the choice of how to cook. Each hut has an ensuite with flushing loo, basin and a hot shower to refresh you after a day on the beach or walking the Anglesey coastal path. The two huts have different designs and aspects: Cae’s decor is country cottage-like while Bryn is more contemporary with vintage touches. So have a look at each one and what it has to offer! The huts are situated within our smallholding – why not visit our other site – www.caerbryniau.co.uk?